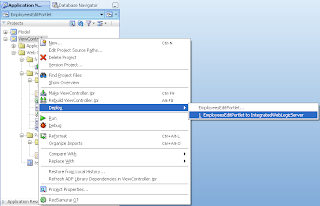 with Webcenter 11g there is no need to expose these task flows as portlets. just use the task flows in webcenter and if you still want to do this , keep your task flow parameters simple , don't use complex or arrays. Yes thats true, but my main idea was if you want to include ADF Task Flow into third party Portal, without WebCenter 11g. How about security, to make it read-only in view mode and editable in customizable mode. I only can do that while using WSRP or Oracle PDK Producer! You said main idea was if you want to include ADF Task Flow into third party Portal. What's about Oracle Portal 11g. As far as i know it doesn't support WSRP 2.0. I'd tested that. 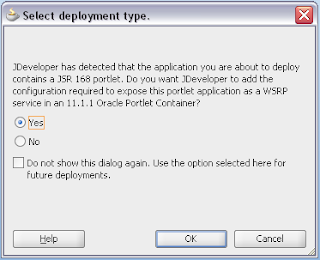 Therefore, Oracle Portal cannot consume such portlet. Correct me if i'm not right. When its deployed, you can subscribe through both - WSRP 1.0 or WSRP 2.0. It should work. Are there any plans to include the ADF JSF/Portlet bridge under the ADF Faces license? 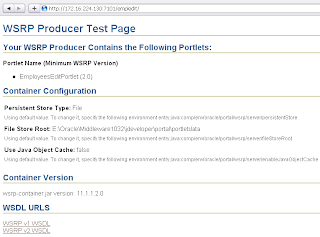 All the examples and documentation from Oracle seem to use both WSRP and the portlet bridge when converting an ADF application to a portlet. 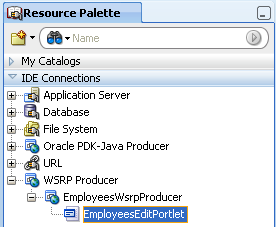 Is it possible to convert an ADF application to a portlet and deploy it to Oracle weblogic portal just using just the portlet bridge? 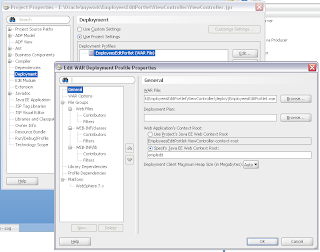 This would mean the ADF application would run as a local portlet in the Oracle Weblogic Portal and would avoid the performance implications of using WSRP. Hi Andrejus ( good work all the time ). Quick question regarding the WAR file deployment, what about the Model components, how are they then linked back to the Viewcontroller files, if they are not packaged up also. In the middle of trying this example. Just wanted to understand this. 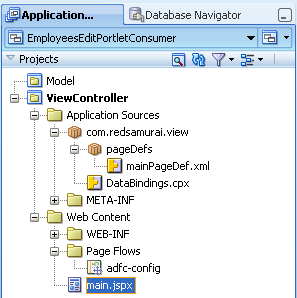 Model project is linked with ViewController through Dependency. When you deploy WAR, Model code will be included automatically. It's a wonderful post. I have an adf application secured using ADF security and wanted to expose the taskflow as portlet. Could you please let me know how to setup security for the portlet to work? I have created one application with ADF customized skins, and afterwards , i have convert the taskflow to portlet as you said here , ( right click and create portlet entry ). Portlet point of view it is working superb , but my customized skins are not working once you convert taskflows into portlet. In our project we have different independant applications. We want them to consume as portlets into a main webcentre application. Another alterantive is exposing these applications as ADF Library. Can you please let me know what would be the best approach. I personally recommend to go with ADF Library. Performance is much better, less bugs with data validation during transactions. Oracle also implementing their applications with ADF Libraries. Portlets are good only in specific cases, when you want to share task flow as a service to remote subscriber system. Also, I want to hide/show the portlet if the number of portlets are more in my jsf application. Portlets are out of scope for ADF Security, its why I prefer to use ADF Task Flows. Really s a wonderful post. I have follow your guide to do a demo(Without using ADF security). And it is ok. But when I add adf security to the producer, and wanted to expose the page as portlet. It does not work, Could you please let me know how to setup security for the portlet to work? 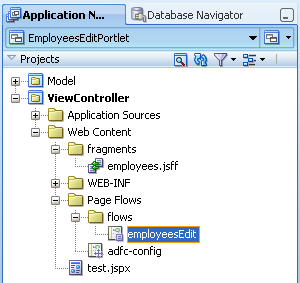 ADF Security can be defined for pages and Task Flows, not for portlets. 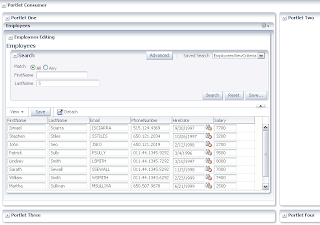 I have deployed a UCM Search portlet on the Webcenter Spaces. But it is only able to search the documents of SecurityGroup of type "Public" in UCM and user is coming as "anonymous" in the UCM logs. In order for the Webcenter login page to propagate user credentials to these Portlet pages so that portlet can all the documents in UCM, I want to configure ADF security. 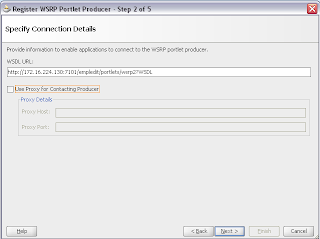 Does anyone have the detailed steps to configure the ADF security specific to WebCenter Portlet application ? But when we load the portlet from WebCenter, I am not sure how the identity propagation happens to portlet (I mean, how the webcenter login credentials are propagated to Portlets)? I believe, this is through ADF security. Do I have to do anything "specific" to configure ADF security to Portlets? We are using WebCenter 11g. Is it possible to have user preferences feature enabled on a portletized taskflow ? Is it a good idea to portletize a taskflow to have the personalization benefit of a portlet ? I am working on consuming a WSRP over Webshpere portal. 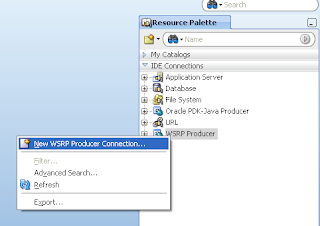 Weblogic server (10.3.5) is the producer for the WSRP which is being consumed on Websphere portal(6.1). 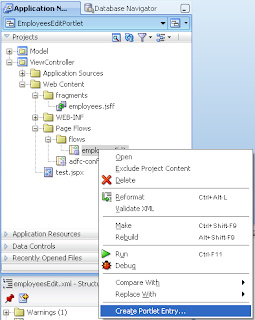 Application is developed with Jdeveloper 11.1.1.6 using ADF template and then converted to Portlet using "Create Portlet Entry" option at taskflow. WAR file is deployed to Weblogic server. 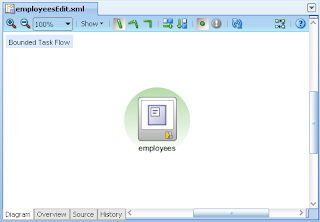 Above URL used for creating a producer on Websphere portal. After consuming the portlet, I am dropping it on a page. Once portlet is dropped on page, page is giving following error: This portlet is temporarily disabled. On server log, I see an error message : "EJPWC1103E: Consumer supplies a registrationHandle/ registrationState pair that is not recognized by the Producer. " When I checked the Websphere portal producer configration, I found that "Registration handle" is empty. 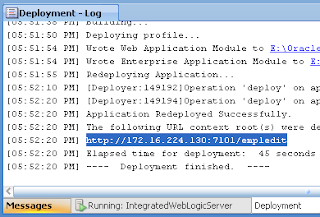 How to update producer registration handle on Weblogic Server so that this gets propagated to Websphere server? I followed the steps given here and have created a WSRP producer which is consumed on Webshphere portal. I am working on consuming a WSRP over Webshpere portal. 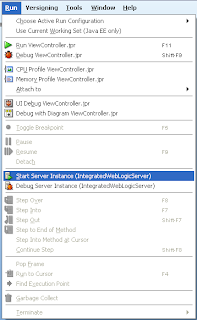 Weblogic server (10.3.5)-JdeveloperIntegratedServer is the producer for the WSRP which is being consumed on Websphere portal(6.1). Application is developed with Jdeveloper 11.1.1.6 using ADF taskflow and then converted to Portlet using "Create Portlet Entry" option at taskflow. WAR file is deployed to Weblogic server. it throwing Exception. (url contains html tags). Please assist me how to resolve. We are trying to consume this in Websphere Portal but I we are getting some wrapper mismacth exceptions. We are able to render the page (JSR 286) but actions on the page not working. Can you please let me know will this work in non-ADF platform? In such case, Do we need to change any settings on Webpshere?